Morning sessions begin at 9am and end at 12pm. Afternoon sessions begin at 1pm and end at 4pm. Have a look at our ‘a typical day at Beehive’ page for information on how these sessions are organised. Additional hours are available from 8am-9am and 4pm-5:30pm at £3.85 per hour or part. The Honeypot lunch club is held from 12pm-1pm and is charged at £3.85 per day. 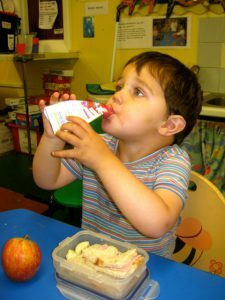 A supervised lunch club where children can eat their lunch and relax or play in a secure, comfortable environment. Parents provide a packed lunch.